12 Great AC Receptacle Options for Panels & Equipment! 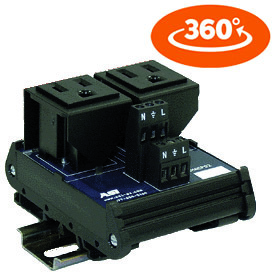 The most cost effective UL approved DIN rail mounted AC Receptacle on the market. 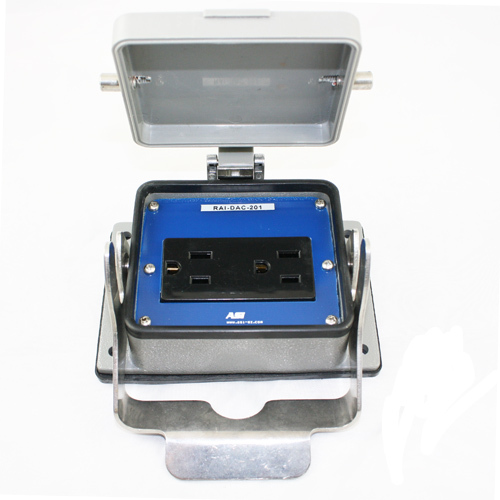 Features include reinforced AC Socket, Double Level Terminal Blocks to provide AC Easily to another device and a Compact Space Saving Design. 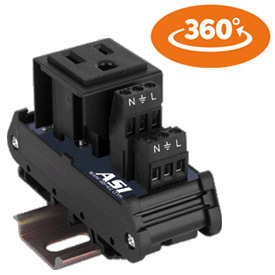 NEW to ASI this UL DIN rail mount AC Receptacle features a 5 Amp Circuit Breaker protecting you from someone plugging in a power tool or device that could possibly create havoc with your controller. 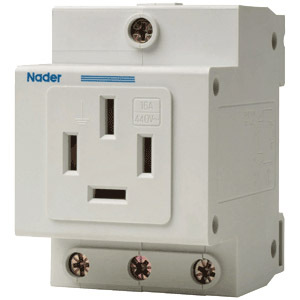 The IMACP01-CB5 is priced to give you both an AC Outlet and Protection, so it won't break the bank. Sometimes you need more than one AC Outlet in your panel so the IMACP02 gives you a Dual AC Outlet with the same Great Features of its smaller brother. Based on your application you may find that your AC Outlet must be of the GFCI type, no worry, ASI has you covered. 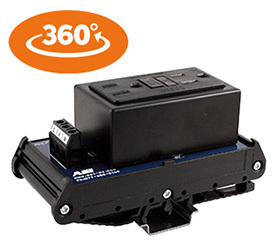 The UL approved, DIN rail mounted IMACGFI02 is a Dual GFCI Receptacle that Saves Time, Space and Money. 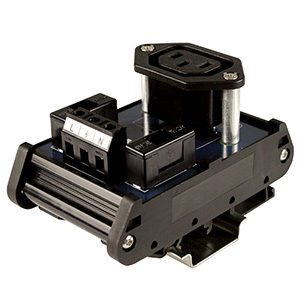 This DIN rail mounted AC Outlet was developed many years ago to meet the needs of a specific customer that did not want standard AC Plugs to be used in his equipment. This module features the IEC type of AC Outlet found on most laptop computer power cords. We added fuses just in case someone got creative and put a IEC plug on a Drill! 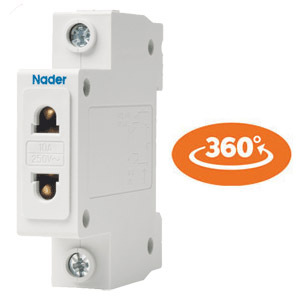 Are you shipping your panel or equipment to Europe, if yes, this compact DIN rail mounted AC Outlet will solve your problems. 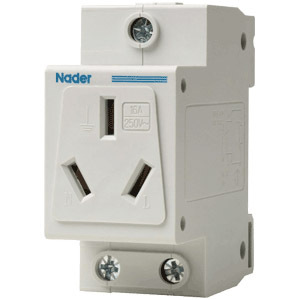 It accepts the standard 2 prong AC Plug found throughout Europe. 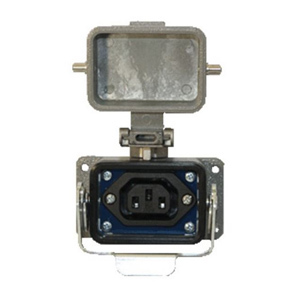 If you are shipping the equipment to China and need a DIN rail mounted AC Receptacle that will accept the 3 Prong AC Plug used there, here you have your solution. Information along with pricing can be found online. Like the previous AC Outlet this model is also used in China but for 3 Phase Circuits. 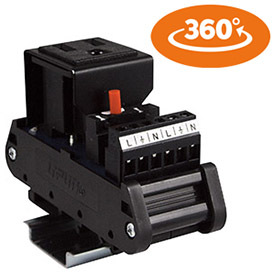 It accepts the 4 Prong Plug used in China and is capable of handling 440 Vac at 16 Amps. If you are not looking for a panel mounted inside the equipment cabinet AC Outlet ASI has other options. If your application requires that your technician access AC on the side of the equipment take a look at the RAI-SAC. 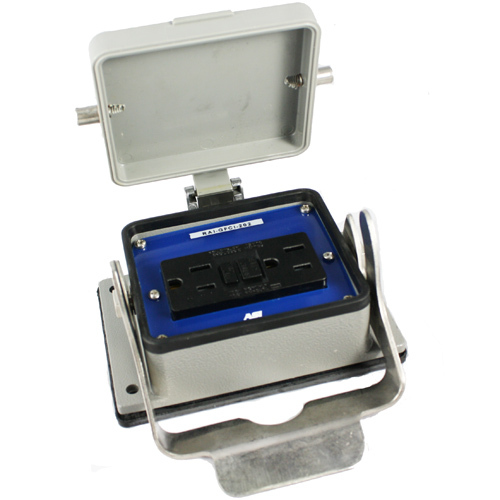 Very compact, NEMA 4, 4X,12 protection the RAI-SAC is in a sturdy, robust aluminum housing. 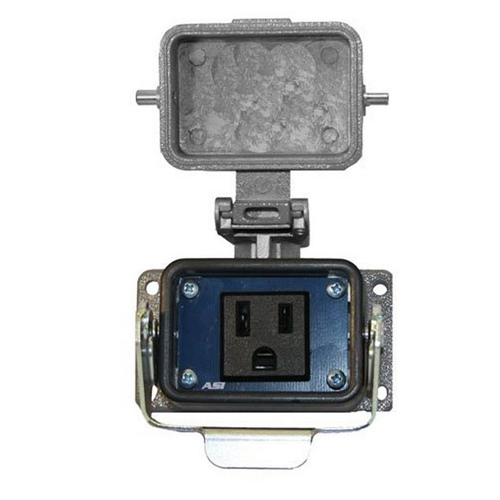 Similar to the above through panel AC Receptacle, this model gives you a Dual AC Socket option. When supplying equipment that are used in wet areas you may want to consider a through panel AC Receptacle of the GFCI type. This through panel NEMA 4, 4X, 12 rated unit gives you the GFCI AC Outlet and the features you need in an industrial environment. There you have it a dozen, 12 Different Ways to Provide AC Receptacles in a Panel, on a Panel and Through a Panel. If you do not see what you need give us a call and we just might be able to come up with a Solution that will Save You Time and Money.